Man, is it just us, or did it seem like the winter holidays would never end? Which is bad when you’re in the information-delivery business because the news just stops. But everyone is back, and we have some cool stuff for this EBB. Sometimes world-changing technology develops quietly without us non-tech types much noticing. But trust us … Eindhoven is a heavyweight in a global WWF-style, no-holds-barred fight to determine which evolving computing technology wins. And the prize is pretty impressive … a market worth an estimated $923 billion by 2023. The deep-tech world, including Eindhoven, is in the transitional phase from conventional semiconductor technology to photonics … and maybe even quantum computing. Eindhoven could become a big winner, because applications for photonics include defense technologies, automation systems, IT, photonic servers and routers, biometrics, life sciences and medical, optical communications, wireless communication and IoT sensor networks. Basically everything on the planet that’s digital. The advantage of light is that it can carry far more data in less time than puny electrons and use less energy doing it. So think of a computer circuit as a race track. Data flow on conventional chips can be slowed to a crawl by the physical limitations of the electronic circuitry. Add photonics, and that allows tractor-trailer size packets of data to fly between computers and data centers. We (and everyone else) got a news release about a new photonics effort in Eindhoven, which is great. But the problem/complication is, there are different approaches, including indium phosphide and silicon for photonic integrated circuit (PIC) technologies. Eindhoven, which is already a photolithography center, is all in for indium phosphide. A group of 16 European universities, labs and companies have started the 4-year InPulse project here in Eindhoven to give startups manufacturing of photonic integrated circuits based on indium phosphide. And the reason this isn’t just another toothless initiative is that InPulse is backed by 14 million euros from the European Commission. Not a lot of money. But companies such as ASML already are pumping hundreds of millions of euros into photonics research. In Europe, indium phosphide is the consensus bet, and InPulse project partners include the Technical University of Eindhoven, Aarhus University in Denmark, the European Photonics Industry Consortium based in Brussels, and SMART Photonics here in Eindhoven. But, the biggest players in the United States, such as Intel, are backing silicon photonics rather than indium phosphide. John Reid, a physicist with one of HighTechXL’s CERN startup teams, tells us, “People bet on their expertise.” The Valley knows there is already a global manufacturing infrastructure for silicon chips. “If you can stick to silicon, you already have the fabs to run it,” John said. There’s only one tiny problem hardly worth mentioning: No one has developed an all-silicon laser, which industry pubs refer to as “the Holy Grail in silicon photonics. No laser, and silicon photonics becomes a less appealing value proposition. On the other hand, there’s not the same existing capacity to produce PIC-based chips, but they exist. Photonic chips have been in research for years. Infinera, based in Sunnyvale in Silicon Valley makes PIC equipment for the telecommunications industry. The goal is to find the optimal way to combine the properties of integrated circuits with photonics in one affordable chip. Marry the best of electronics with the best of light. Combining two boxes into one chip not only adds functionality but makes it cheaper, faster, cooler and more energy-efficient, John says. 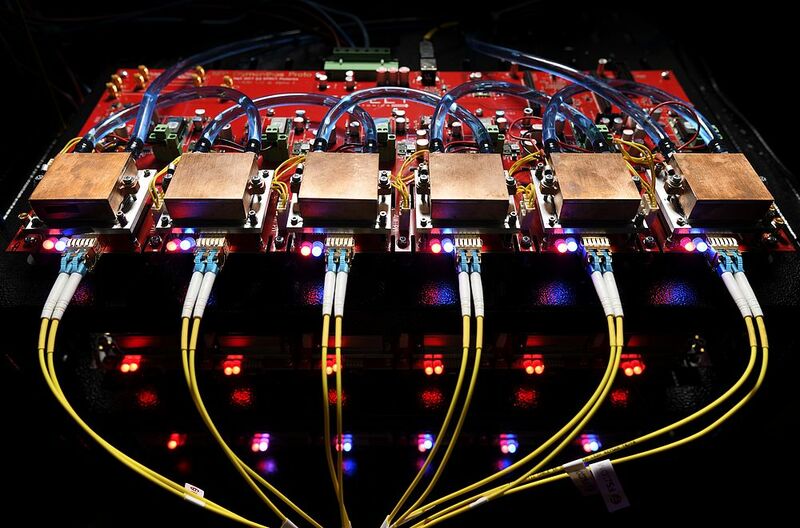 Eindhoven’s play is creating generic building blocks to allow those who want to design a photonic chip for a specific functionality. For those who know what they want to do, Eindhoven has an integrated photonics platform – a design library if you will. • Eindhoven, a partnership between TU/e and SMART photonics group. They put together your design in a multi-process wafer, then that wafer is shared with other customers, bringing development costs down. So, voilá, they process your order and send you your chips. What is this technology used for? At the moment, not much in the way of consumer goods. Photonics adds functionality in the aviation industry, such as fly-by-wire controls for aircraft as well as a new generation of tools for designing aircraft and detecting flaws in the manufacturing process of, say, wings. Companies such as Genexis, an Eindhoven-based home solutions product is developing a device that takes optical fiber coming into a home and splits the data into TV, Phone, computer and wi-fi. But this is just the beginning of the shift to photonics, and Eindhoven has a chance at owning this revolution just as it owns photolithography. As we always say, the future is being invented here. When photonics does become widely adopted, it’s likely the technology will already be in use in the Brainport Smart District, an experimental community under development by TU/e for Brandevoort, a New Urbanism development east of Eindhoven. How will we live in 2050? Brandevoort is both the site of conception and construction. It is a place to experiment, together, on every aspect: from build, energy and mobility, to safety and health. Everything will come together under one district. Smart Mobility will focus on excellent commutability. Food Technology will work towards a healthy city. We are accelerating our sustainable ambitions. Zero emissions is no longer an ambition, but a daily reality thanks to the likes of geothermal energy or solar fields… there’s space for that here, too. Shared living, smart sharing. All of the pieces to the puzzle come together in Brainport Smart District, where future living is taking shape! Mark your calendars, EBB readers – you’re among the first to be invited to HighTechXL’s Beyond Tech high tech conference coming up 11 April at High Tech Campus. Beyond Tech is shaping up to be THE premier high-tech conference in the Netherlands as HighTechXL opens registration to regional, national and global startups, investors, corporate partners and community leaders in love with high tech. • Startups matching up with investors and corporate partners for 15 minutes of face-time. The event management platform uses an algorithm to rank matches among the databases, then adds them to your conference agenda. • 25 Expert Sessions (workshops) featuring high-profile presenters with topics like innovation, sustainability and entrepreneurship. Hear the story of Dutch startup Psylaris and their time at Y-Combinator in The Valley. Or how imec leverages technology to strengthen the socio-economic backbone of a city. And, like, 22 others. • a pitch competition where 10 high-potential startups will compete for prizes from Impact Track Ambassadors ASML, Philips, NTS Group, imec, TomTom, BOM, ABN AMRO, EY, DSM, Here, Accenture and IBM. Eindhoven isn’t just another tech hub, and this isn’t just another tech conference. First, it’s free, which is affordable for all startups, and second, it’s all about HTXL pulling together the brave, the bold and the unconventional. The fun, excitement and networking opportunities are bonuses. You can sign up here as a startup, investor/corporate partner, attendee (if you don’t want to do matchmaking) and student ambassador. The conference is scheduled for 9:30 to 16:00. Check the website for details about the location of individual events. HighTechXL executives and team members have decades of experience building businesses. They’ve seen it all and done it all … and they’re ready to give all that institutional knowledge away. For free! If you have a startup – anything from an idea to a team with an MVP – you are invited to HighTechXL for SmartConnect. SmartConnect is an evening of feedback, advice and wisdom – our way of reaching out to startup teams who can use some expert advice, direction, fresh thinking or maybe a bit of encouragement. In other words, the unvarnished truth about what the world is looking for in teams, tech and tenacity. Our next SmartConnect is 25 March at Building 27 on High Tech Campus Eindhoven. The event starts at 16:00 and runs till 18:00, followed by drinks, snacks and networking. SmartConnect is an informal meeting of minds so do NOT wear a tie. You’re free to bounce ideas and brainstorm with expert pools to get detailed feedback about where you are in the process of building your company. HighTechXL team members and community experts from Eindhoven’s legendary ecosystem will be on hand to answer your questions about the trickiest aspects of starting up in a variety of domains. So you can get smartened up AND broaden your network … which any investor will tell you is an essential step toward success. This program has been running as Give Back Monday since last November. We’ve upped our own game after working with about 40 entrepreneurs. So, get ready to get smart and get connected. So we’ll know what you do, please submit your one-pager/executive summary to helena@hightechxl.com. Roundtables are set up with experts on finance, IP, team building, business plans, marketing and other topics, and teams rotate through the evening. We’ve already met with startups from Eindhoven and the region. They include next-gen AI-enhanced travel tech startups, blockchain-based startups, additive technologies and a SaaS scale-up. While HighTechXL is focused on deeptech, we’re happy to talk with all startup teams. BUT, these events tend to draw standing room only crowds, so please register in advance. The roundtable format gives each group about 20 minutes with each expert panel. SmartConnect – Connecting your startup with our know-how. Microsoft has announced that it’s integrating more TomTom products into its navigation products. This makes the Amsterdam-based geopositioning pioneer a leading supplier of navigation data for the Azure cloud platform from Microsoft and for Bing Maps, according to a Microsoft news release. We’re mentioning this because TomTom just opened operations in Eindhoven late last year at High Tech Campus. The HTC operation is the main site for the development of software products for the automotive industry. TomTom’s clients include the largest auto manufacturers in Europe, including Fiat-Chrysler Renault, Peugeot, Citroën, Volkswagen, Audi, BMW and Mercedes as well as Japanese giant Nissan. This is about more than the move toward autonomous vehicles. This is about current consumer expectations. Azure Maps SDKs using TomTom services supply a ton of data, including real-time parking meter rates and street-specific traffic info. that help drivers avoid wasting fuel in traffic jams … and help them go easier on the planet. Just a few weeks after opening the Netherlands’ largest startup hub, High Tech Campus Eindhoven is creating an app that will catalyze the local ecosystem. The High Tech Plaza app will make it easy to connect “in the virtual world, not just in the physical buildings,” said Paul van Son, campus marketing director. The goal is to build a database of people and their skills to enable people in this ecosystem to search for contacts and help by specialty or by name, van Son said. There are at least 12,000 people working on the campus at Philips, NXP, Shimano and other companies. The app will be live in a few weeks to connect people and will include an events calendar, van Son said. “The app will also have a category where you can throw out your concept and ask questions. And there’s a bulletin board: ‘I need someone who can help me with press releases’ and things like that. You get a notification. If you’re interested, people can send you a direct message. Salvia BioElectronics just got a capital infusion from the Brabant Startup Fund. Salvia has created a non-invasive bioelectronics solution for people suffering from chronic neurological disease. They’ve raised a total of about 3 million euros.